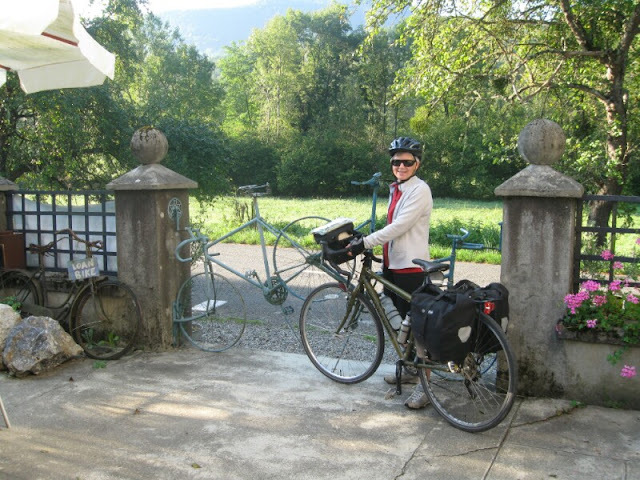 Wow (woman on wheels) participant Susan Minnich returned from her second bicycle tour in France recently. 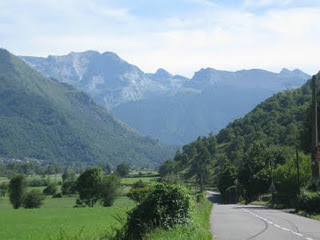 Suzecyling routes cover the Atlantic to the Mediterranean and the Pyrenees mtn. regions of France. I caught up with Susan through an e-mail Q and A. Here is what Susan had to say about cycling in France. 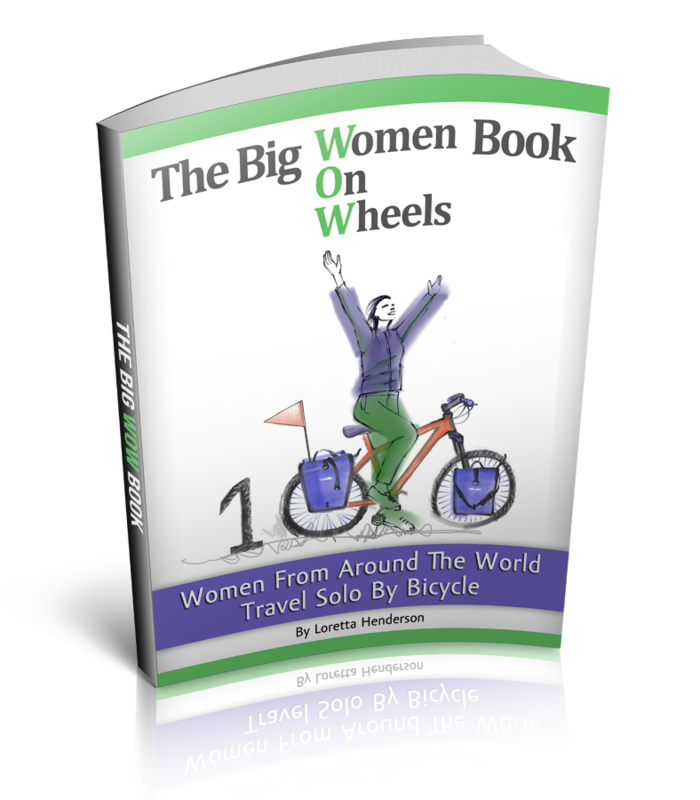 Cycle touring is not that popular where you are from, how did you get into cycle touring? In the 1970s I spent quite a bit of time backpacking and cross country skiing in the mountains of the US and Canada. During the same period, I commuted to work on my beloved Fuji 10- speed and rode for fun on weekends. Even then I so enjoyed cycling and bike touring seemed like a good, tempting idea to me…30 years happened next, but how time disappears like that I really can't explain. Got married, left NYC, built a solar house in the woods and a big garden...and never had both time and money to travel, by any kind of transportation. My job now provides vacation time. The first two years I stayed home to work in the garden and on our still-not-really-finished house, hike in my nearby woods and hills and enjoy life here. But a year later something gave way. I had long since given my Fuji bicycle to a friend's child and I missed it. I walked into my local outdoor store and bought a bike. I never, ever spend $500 or so that fast. Fell immediately back in love with moving myself around on two wheels. That was in September 2007, with almost no riding weather left here. The next year I went on my first tour. …A lot of people ride bikes there. I love being immersed in such a rich and old culture, one that has in many ways informed the culture in the US, but that remains so uniquely different. In the US, the operating ethic is new, new, new, more, more more, bigger, bigger, bigger. Older things, buildings, roads, communities, are very typically destroyed to make way for the new. In France, human culture has written itself, embedded itself on and in the landscape in an intrinsic, respectful way that we don't see here… You don't need to ride great distances to experience changes…Every valley or mountain peak brings something different. Cycling is also respected there, and so many people have ridden a bike. Usually cars give you a good amount of space, and I've never been hassled. Was France your first tour location? My first bike tour was in September 2008 when I rode around Lake Champlain, a very large lake in Vermont, USA and Canada, a bit north of where I live. My husband had foot surgery and it turned out his recovery took longer than anticipated. So I went solo. My memory is that it was about 300 miles, pretty flat, mostly. Do people at work understand your passion for touring? Not at all. People are mostly supportive and intrigued but I think my cycle touring is generally considered a bit eccentric, or whacky, especially so because I tour solo. Several colleagues do quite a lot of bike touring, but always in supported tours, and that's true even of the serious cyclists, who are no doubt much stronger riders than I am. They come closest to understanding, but they don't get it why I would ride carrying my own gear, much less solo ... and certainly not camping! What's your favorite road side snack? Hmmmm.... in the morning I snack on whatever I take from breakfast -- often cheese and baguettes. I stopped being shy about asking to take food from the breakfast table with me, explaining that I was on a cycle…..Oh yes, you asked me for my favorite snack. That would be fresh locally grown fruit and local goat cheese, with a bit of baguette. Your bicycle has a great name. How did you come up with that? Thanks!! Papillon. It is the word for butterfly in French. During my Cévennes trip, one day I was slowly working my way up a pass. It was hot, and I kept climbing up, up, following the shade from one side to the other of the road. I noticed small green butterflies, fluttering seemingly always just in front of me, from side to side, making their way, gracefully, if slowly, in the world. My bike is also green, so the phrase "ma bicyclette, mon petit papillon vert" came to mind. That is an awfully big name so she became just Papillon. We flit along, not too fast, but make our way to many truly beautiful places. What type of bike is Papillon? Papillon is a Cannondale Touring 2. I bought her just before my Cevennes trip, knowing it would be a lot better riding in steep country, with weight, than on the Trek I bought earlier. The Trek is now on an indoor setup for winter and I ride on it sometimes locally especially on our dirt roads. I've been lucky and not had any substantial problems…. Any plans for your next tour? Not yet a plan, it's still in the dream stage…however, I've never seen the Alps. My imagination starts on the Atlantic ... in France, slips quickly into Spain, rides some of those high Pyrenees passes, crosses the Midi, riding Aigoul and then Ventoux, finds the Alps and finishes with a quick dive into a tiny bit of Italy .. on the Mediterranean.